I’ve rounded up ten of my favourites here, which between them should cover every eventuality and satisfy even the most demanding hand printing fans! Brandon Grotesque has been something of a runaway success for designer Hannes von Döhren since it was launched back in 2010, so its no surprise he should consider creating a hand-stamped version of the font. Not to say HvD hasn’t got previous form in this area of course, as the foundry behind the equally successful Cheap Pine, the 2011 wood-block effect font so beloved of craft breweries and wood-fired pizza restaurants up and down the land. 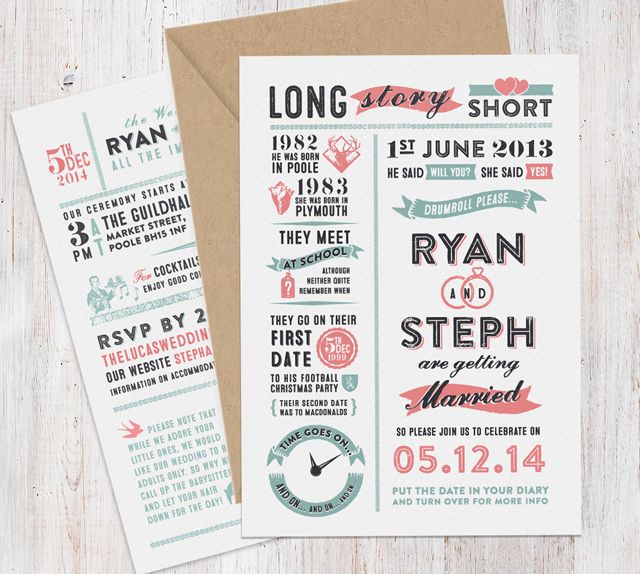 As you might imagine then, Brandon Printed is an expertly produced, detailed and stylish example with loads of extras, ornaments, lined options, shadows thrown in to the mix. Ryan Keightly is a fairly new addition to the type world, but he proved himself to be bang on-trend with his warm and endearing Sparkle Script, released back in September. He’s added to this with his latest font “Butternut“, which takes a hand-drawn old-style italic serif font and passes it through all manner of print processes. Butternut’s hand-finished style would make it perfect for packaging, and works well with chalky colours on a darker background. 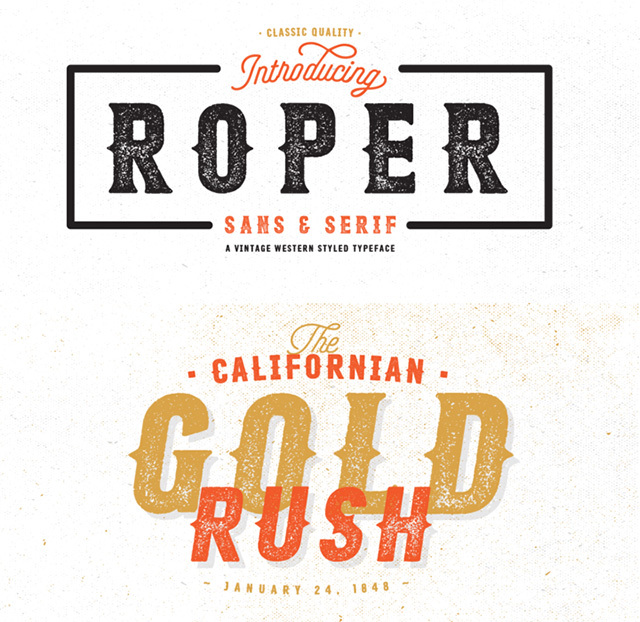 Roper from Andrew Footit is a Western-influenced font, with crossbar spurs giving it that distinctive American feel. 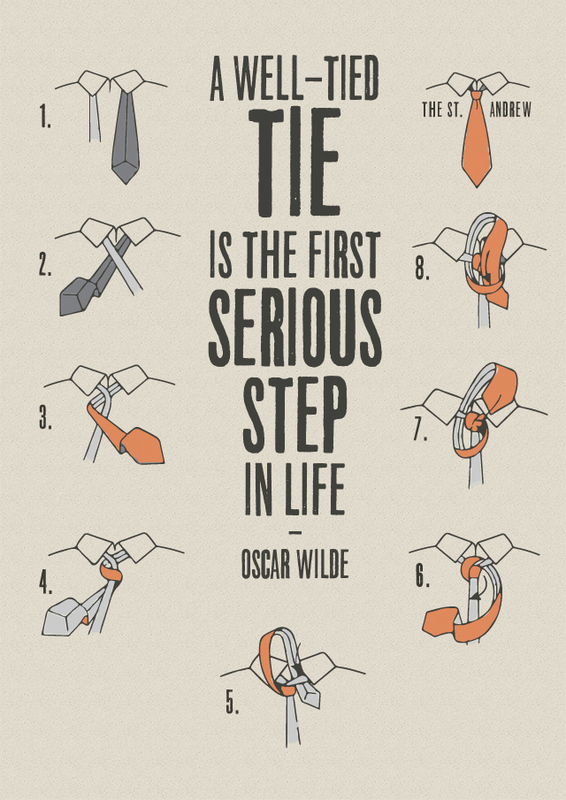 Available in both serif and sans serif versions, each has a solid and letter-pressed style. The solid versions are nice enough, but to my mind the font really comes alive with the letter-press alternatives. While not as flexible in use as some of the others here, sometimes that Wild West look is the only thing that will fit the bill! 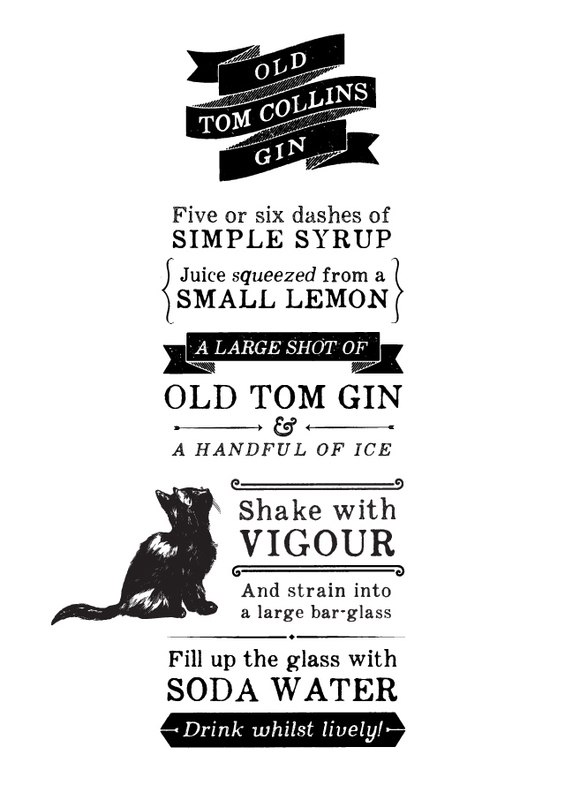 Yellow Design Studio are another foundry with a solid track record in producing weighty, ink-heavy stamped fonts. Their Veneer regularly gives HvD’s “Cheap Pine” a run for its money, and their iconic Thirsty script family fast became the professionals’ preferred “Lobster” alternative. Lulo is a new offering from the designers and takes a slightly different approach to some of the alternatives, with a fabric-based texture giving more of a screen-printed effect to the lettering. A subtle difference, but one that changes the feel of the characters completely. Clever layering options and well-realised shadows give a great 3D effect when combining colours across the full font family, and a good value combined price for the full set makes it a commercial font worth adding to the toolkit. 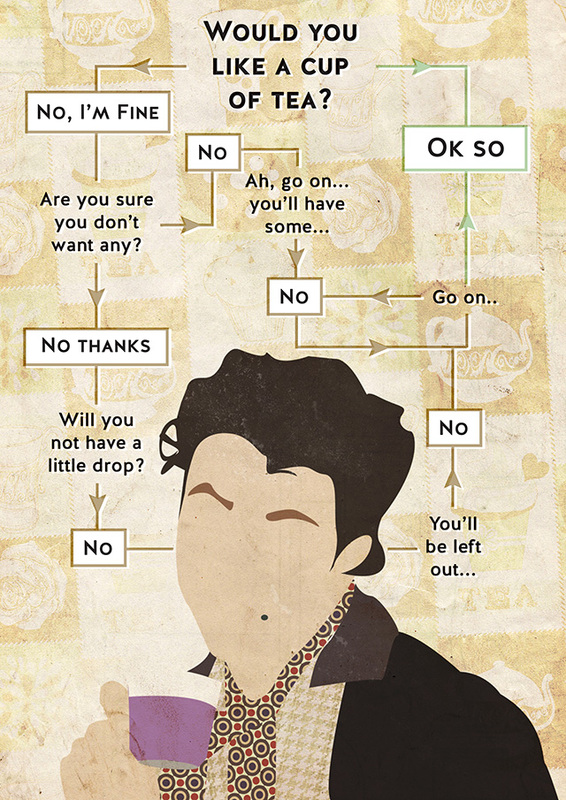 Appareo has been featured here before, but worth including here again since it gives a different take on things to many of the others featured here. 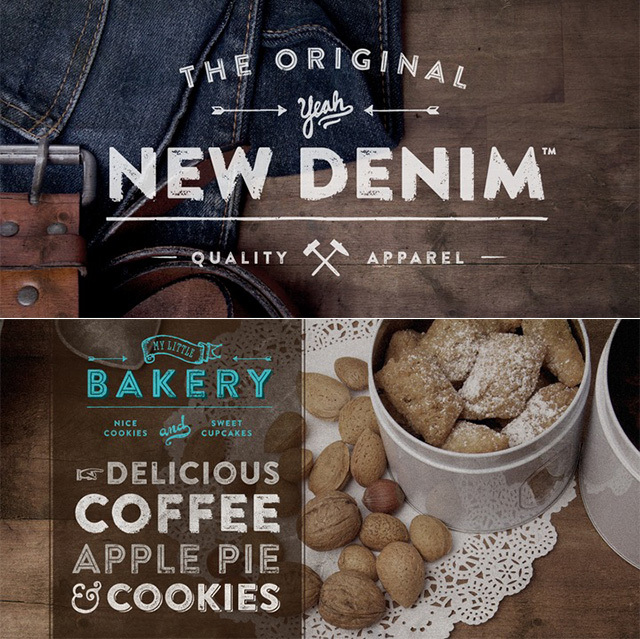 Where most are clearly display fonts – that is, fonts that are really only intended for small blocks of text and headlines – Appareo takes a lead from period book-type and vintage printing presses. This makes it perfect for slightly longer passages of text, labelling, menus, and works perfectly when going for a more “antique” style. 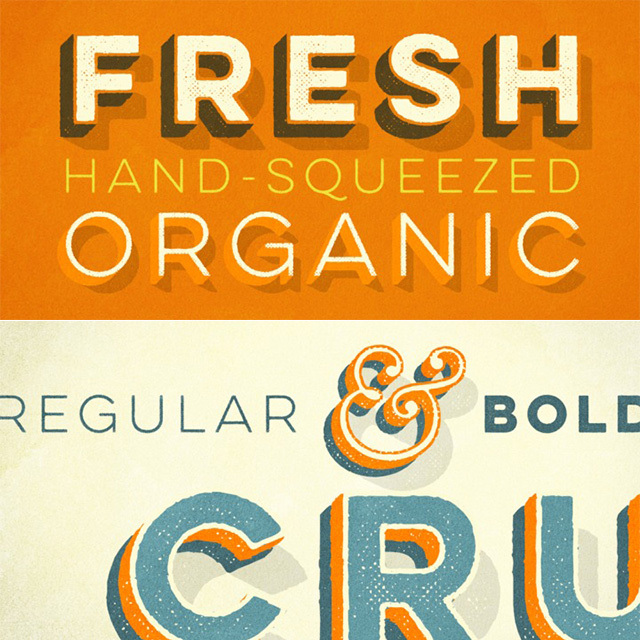 The font does an expert job of reproducing the quirks and ink-flows of vintage mechanical printing, and some advanced OpenType trickery means textures are automatically varied as you type to keep things looking authentic. 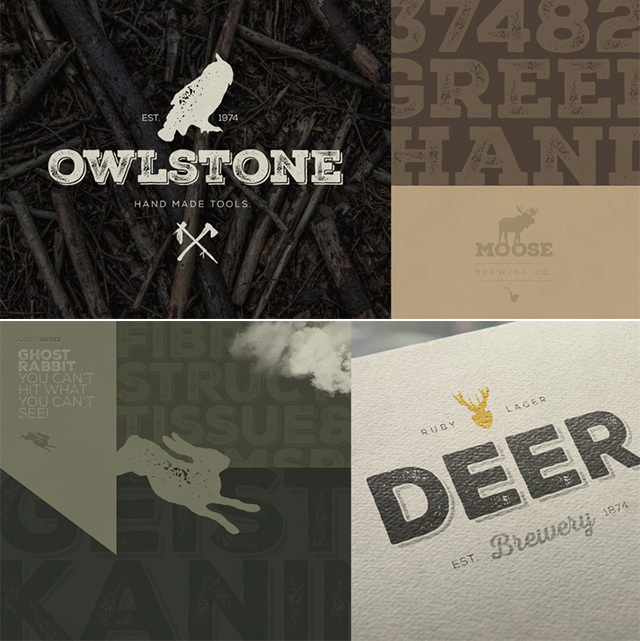 Microbrew from Jay Hilgert of Albatross is one of my favourite fonts to have been released this year. With 16 font styles, extras and quirky retro ornaments at under £30 it represents great value for money and the combination of shadows, inline versions, different textures and different printing techniques makes it far more versatile than might be expected for a type family like this. The condensed shape of the characters also gives a nice contrast to the wider letter shape of the likes of Brandon and works well alongside other families, and the canny font buyer could always download some of Jay’s free alternatives from the complementary “Signyard” font to further extend possibilities! Fontfabric’s Nexa Rust is a vast, sprawling font family of scripts, slabs, ornaments and sans serif faces, all designed to work alongside each other in a cohesive, structured way. 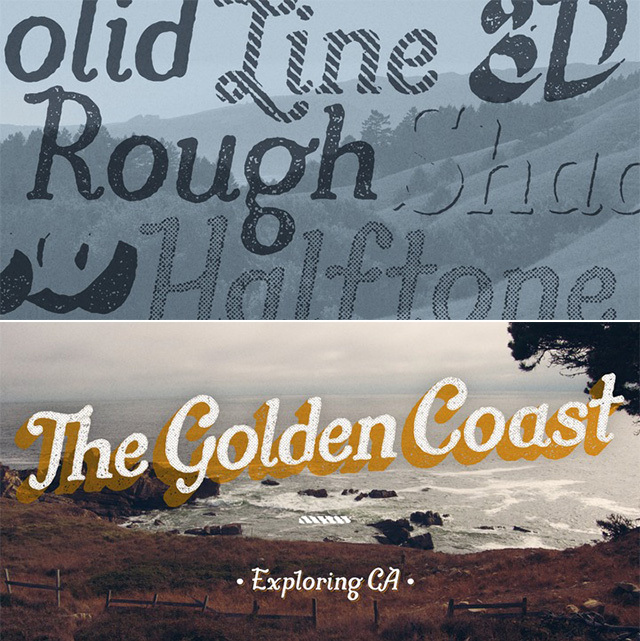 With over 80 fonts in the family, acquiring the whole set is an eye-watering prospect and probably best left for commercial projects. But individually there are some great options in there not found in other families, and Fontfabric’s professional expertise guarantee an excellent finish, flawless execution and high detail at large sizes. Back to Yellow Design Studio and their increasingly popular 2014 Gist font… Gist Rough is the printed, textured version of the typeface, and retains the monoline, swirling, late 70’s/early 80’s-influenced aesthetic of the original. While the texturing is a bit on the rough side compared to some of the other fonts featured, the distinctive shape, ligatures and style of the lettering makes this ideal for poster design, packaging, T-shirt logos and anywhere you fancy a blast of retro-contemporary chic! Corradine Fonts have taken a slightly different approach to many of their peers with their Emblema Headline font. Where most have gone down the 1800’s wood-block route with simple shapes and uniform dimensions, Corradine have opted to take the Deco path. 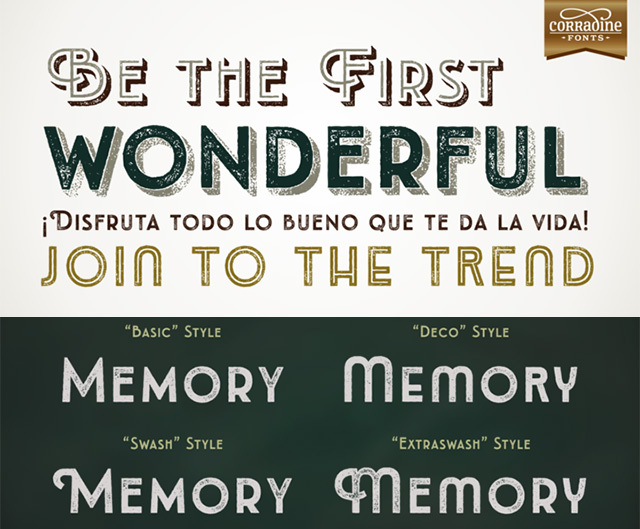 The now-standard layering, shadow and inline effects are all present and correct, but paired with elegant proportions, 20’s-style vintage curves, small caps and a range of aesthetic quirks that set it apart from many of the alternatives. Emblema is currently on offer with the full family of 52 for under £10, which represents outstanding value! Lastly (but my no means leastly) we have Core Circus Rough from the consistently innovative S-Core foundry. S-Core have taken layered font combos to new heights with their ‘Core’ font systems, with a sense of fun and playfulness not always obvious elsewhere. Core Circus is no exception, thriving on colour, packed with entertaining alternatives and options, and perfect for bold, celebratory designs. 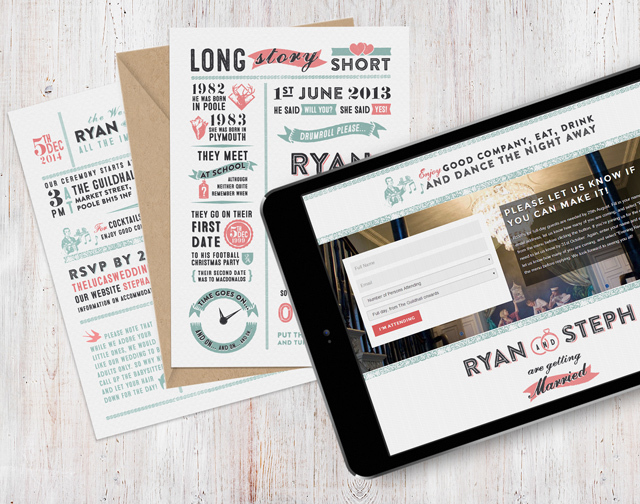 Ryan & Steph thought a Wedding website would be the ideal way to make it easy for their guests to RSVP and find out more about their day, so we set about creating a fun vintage design that would work equally well online and print. There are plenty of ways you can share information about your wedding day with guests, like info sheets and wedding maps, Facebook groups or email updates. Increasingly people are setting up wedding websites, with lots of services out there letting you add content, maps and links to their pre-designed templates. 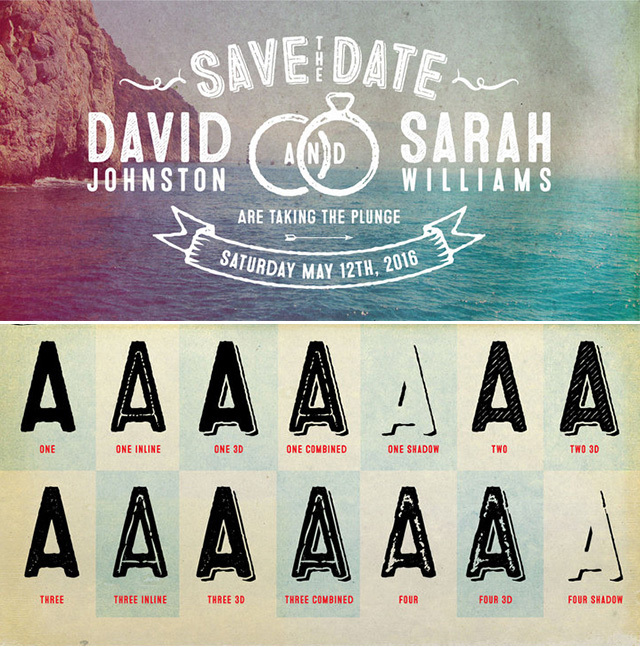 Steph and Ryan however wanted to theirs to be designed to closely complement their printed invitations, so asked if I could produce both at the same time. Steph had a clear idea on what she wanted, with vintage-style lettering and an old-fashioned poster layout detailing the back-story to their engagement and wedding. 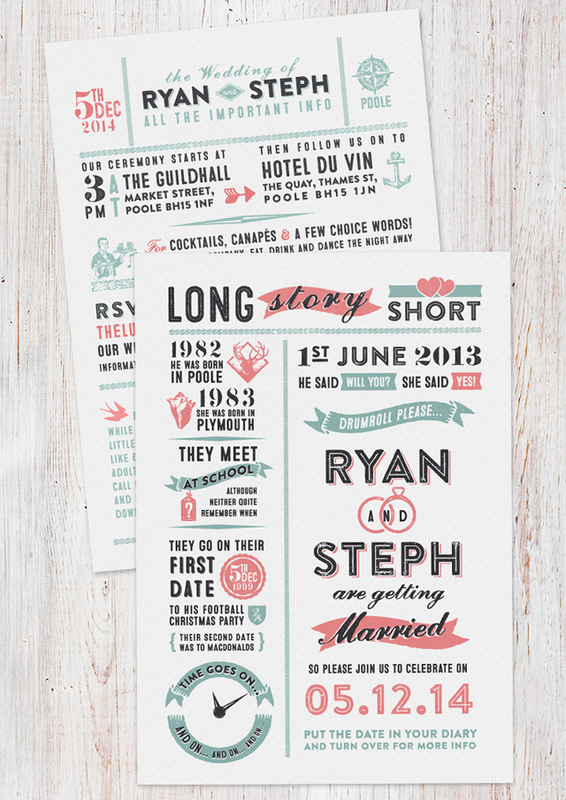 We agreed on some dusty, dusky shades for a splash of retro colour, and I used a combo of HVD’s Brandon Printed and Microbrew from the Albatross foundry – two newish type families packed with weathered detailing, inked imperfections and vintage ornaments, that worked perfectly together and gave Steph the look she was after. For the website the ever-flexible WordPress was used, creating a simple but flexible site that can also be used to display maps, photo galleries and all sorts of helpful guest-friendly info. 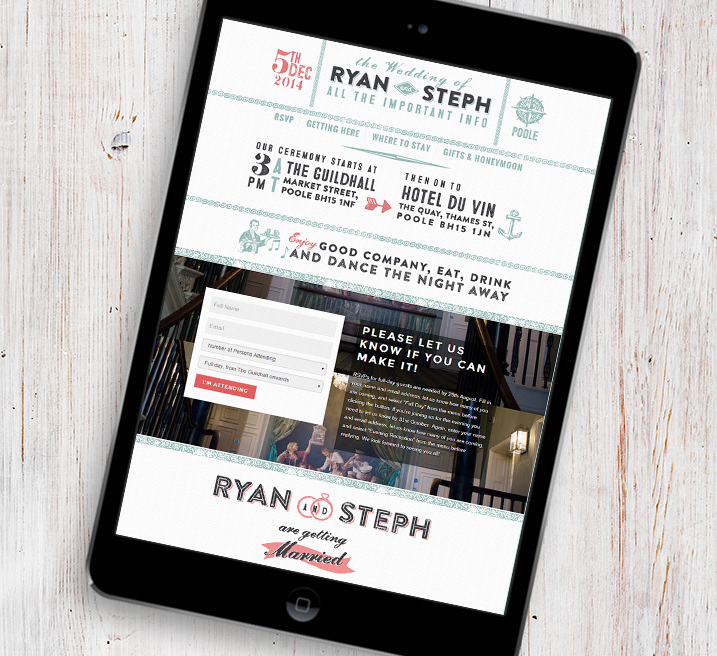 Ryan and Steph had their own login details too, so they can update all their information whenever they wish. 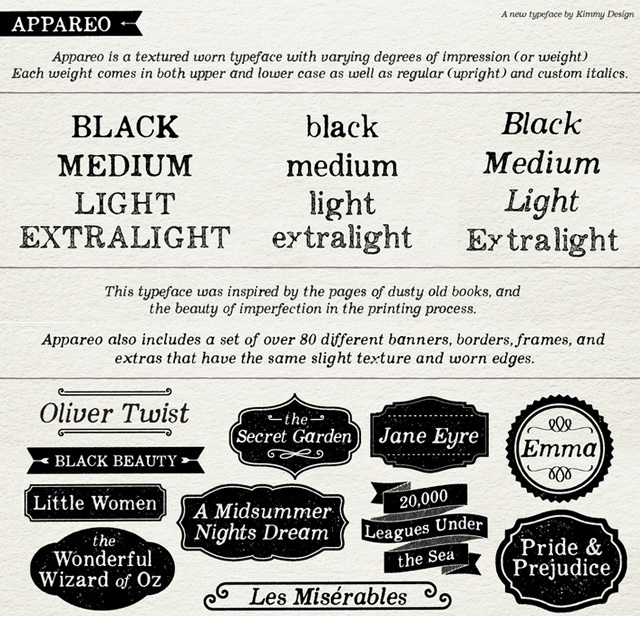 Appareo is the latest font family from the hand of Kimmy Kirkwood, owner of boutique design studio Kimmy Design. Kimmy offers an eclectic collection of typefaces, from the on-trend retro serif of Station to the hand-drawn whimsy of Lunchbox. All are executed to perfection, with multiple weights and textures, OpenType alternates for a human touch on the hand-drawn characters and regularly come with complementary ornaments and extras. For Appareo Kimmy has turned to vintage books and the pages within, creating an imperfect, worn serif. The family consists of a range of weights (with italic options), each having a varying degree of distress. The fully set Black has the press and ink fully set into the page while Medium, Light and Extralight are progressively lighter in print, with more obvious textures. As with Lunchbox, each character has several OpenType variations. This means no two same letters will ever be found adjacent, creating the appearance of an aged printing press. A selection of arrows, banners and flourishes complete the family, making this an ideal package for design-based work rather than simply setting text. The high level of detail means that Appareo wouldn’t really be suitable for large blocks of small-size text or use as a webfont, but it would be perfect for anyone looking to give a touch of vintage authenticity to invitations, menus, labelling or other print design. More examples of Appareo in use can be found on Kimmy’s MyFonts store, where the entire font family is currently available for the discounted rate of $21. It’s safe to say Mateusz Machalski from Polish design studio Borutta is a man who likes his woodblocks. 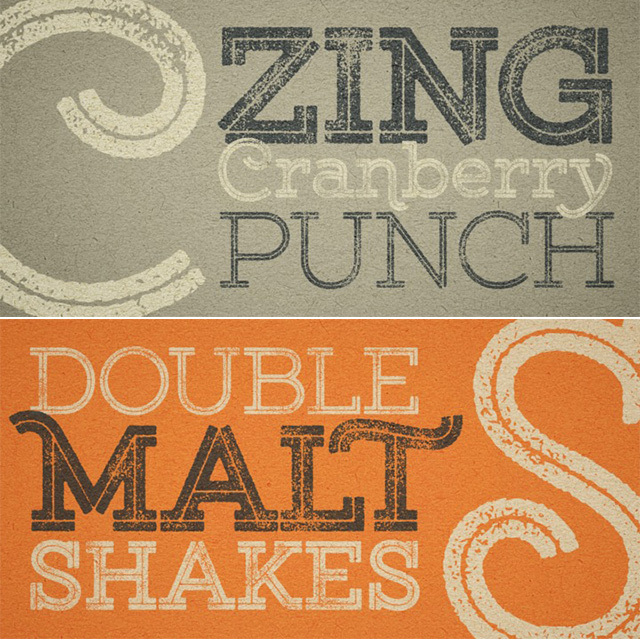 A quick scan through some of the typefaces on offer from the prolific designer show a passion for bringing the distinctive warmth and character of ink-stamped lettering to the digital screen. 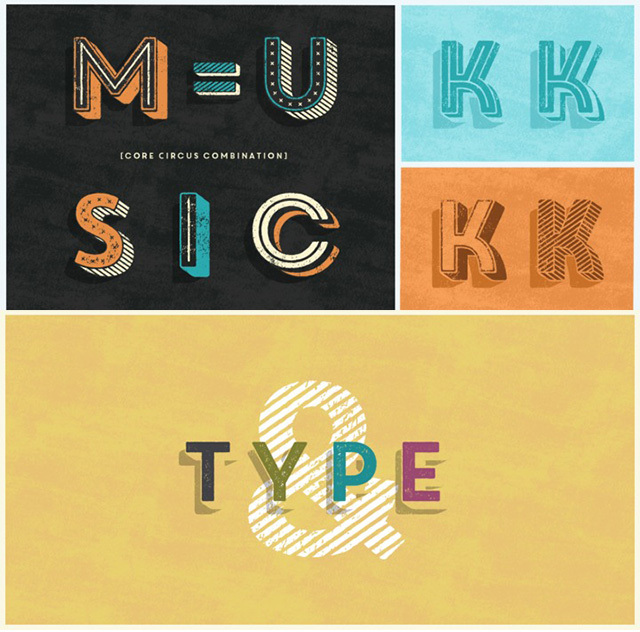 Released late last year, the Wood Type Collection brings several of these together in a single family – kind of a one-stop-shop for anyone looking to lend a bit of vintage authenticity to their designs, without actually having to invest in a physical printing press. In amongst this set I was drawn to Niunia, a narrow uppercase sans serif with irregular weights, slightly wonky alignment and other subtle quirks that gave it a little more character than some of its siblings. There’s no OpenType trickery here and no obvious variations between upper and lower case, but don’t let that put you off. Niunia contains a set of well-crafted letters with realistic-looking ink distribution and corner traps, that manages to avoid looking contrived and artificial. The complete Wood Type collection from Borutta contains 5 different styles ranging from elegant serifs to inverted sans and is available to buy from MyFonts and Youworkforthem, which also feature more examples of the font in use.